Have you ever dreamed of travelling in a vintage VW Campervan? Don’t just dream it: we can help you live your dream in a genuine, fully restored 1960’s or 1970’s Campervan or Microbus. We want to share the joy of these iconic, classic vehicles and continue to assist people in making happy memories they can keep forever. Whether it is a bucket list dream or you just like the convenience of renting a self-catering holiday home on wheels, Volkswagen Campervan hire in Scotland is a brilliant way to travel around the UK. 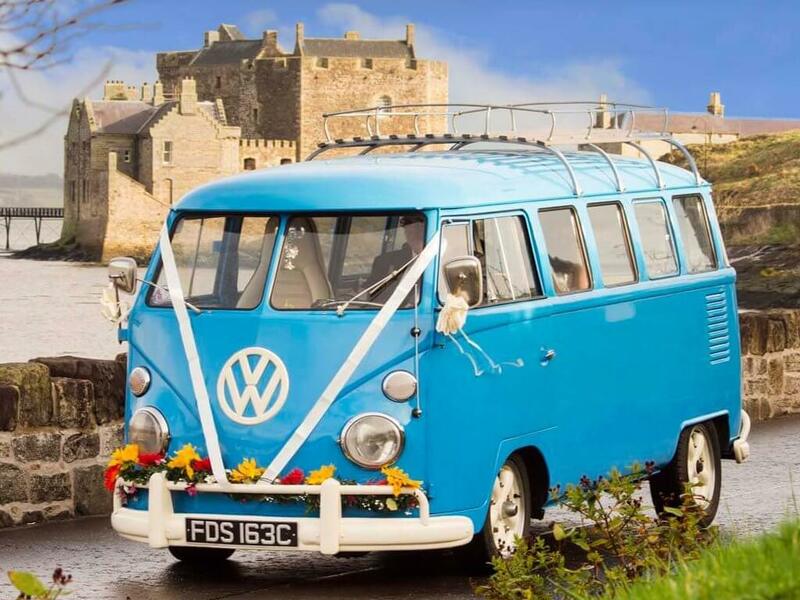 Or you may be planning a Wedding or event in Scotland and want us to provide a campervan wedding car or a unique way to transport VIPs. We are ideally situated as the starting point for your adventure into the tranquil and awesome Scottish countryside. In one of our fully equipped Bay Window Campervans your holiday will begin a five minute drive from The Falkirk Wheel and The Kelpies in the heart of Scotland. 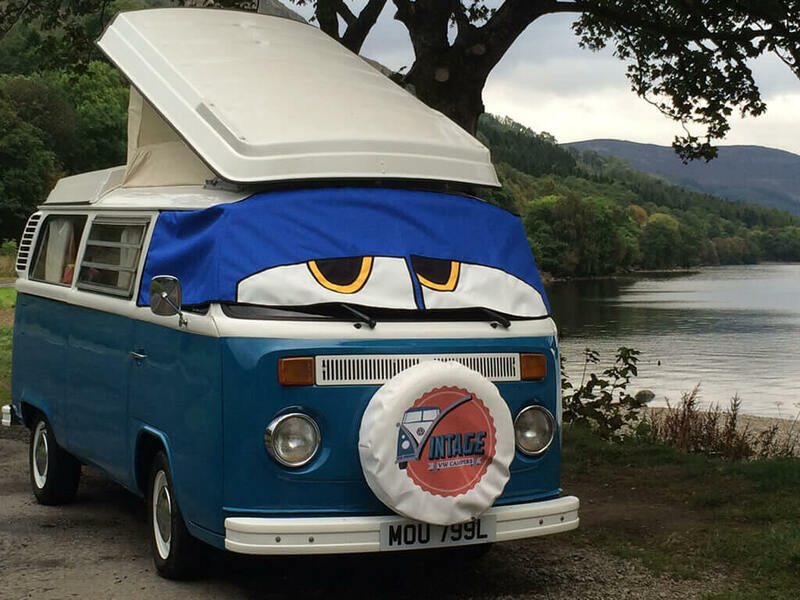 Hire a VW Campervan from Vintage VW Campers in central Scotland and if you wish we can help out with itineraries and routes based on your interests. We provide sat navs, maps and everything you need. The full list is on our equipment page. Choose your favourite 2 to 5 berth available. Add The Nodpod our Teardrop Trailer to your booking for more space. Our campervans are dog-friendly, we welcome well behaved dogs. You can hire a VW Campervan for your Wedding & Honeymoon Roadtrip. Covering Edinburgh, Glasgow, Stirling, Falkirk, Lothians, Fife, Perth & more! We can chauffeur drive you to your Wedding or special occasion in true vintage style in our Split Screen Microbus. Meg is a 1965 eight seat blue beauty, with ivory interior, simply stunning. We invest lots of love, time & money to keep her as good as new, in pristine condition. We don't rent her out to other people, she's not got a kitchen or curtains in her and this all makes her a pretty unique wedding car. In fact many say she is the most immaculate VW Campervan for hire in Scotland. Don't take our word for it though, read our reviews or arrange to come and see her for yourself. Or if you don't have time you can always view her 360o virtual reality interior tour. She is suitable for Brides & Grooms having traditional or classic weddings, barn or boho weddings, festival weddings, vintage weddings: so many wedding themes can be accentuated by this amazing vehicle. Gift vouchers are available, should you wish to help a loved one follow their campervan dreams. Ideal anniversary or retirement gift or birthday present for someone special. 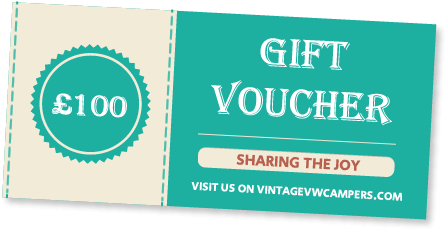 If you want to make your loved one smile, our vouchers are the perfect gift for the VW Camper fans in your life. Plan your 2019 tour of Scotland now or why not put them on your Wedding Gift List? They could make the best birthday or Christmas gift ever and if you're lucky the person you buy them for may just take you on the roadtrip too!